Have you ever dreamed of being the beautiful damsel or a brave knight of the Castle, exploring it late at night by torchlight? 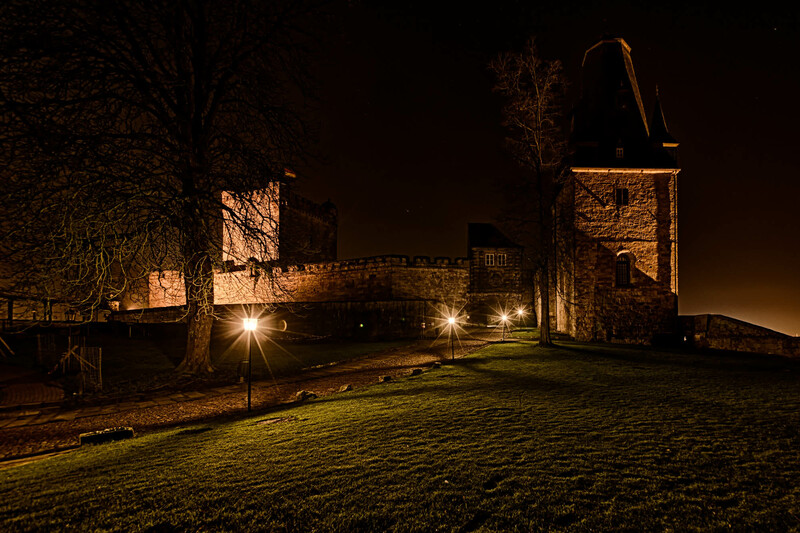 We allow this dream to come true on Bentheim Castle Night. We invite you to participate in a very special tour of the Castle, one we hope you will never forget! Two pikemen and even a real-live prince will be on hand at the start to personally welcome you at St. Catherine’s Church. In keeping with tradition, the evening will begin with many candles and medieval music. During your tour through the Castle you will learn many interesting and amusing things worth knowing about the history of Grafschaft Bentheim. In doing so, your guides will also have a chance to give their best in interludes of singing. Torches will light the path along the outer walls so that you may reach both towers, which afford a magnificent view of Bentheim and the surrounding countryside by night. Let’s hope we are lucky enough to have a starry night in store when you come! But you do need to be wary of the Bentheim Castle Ghost, the “Witte Jüffer” (The White Maiden), since whoever captures a glimpse of her turns white, and according to legend, is doomed to die. We certainly do not want this, especially since at the end, not only the Kronenburg awaits you, but also a little something to give you sustenance as the evening slowly winds to an end. The tour about lasts an hour. We would be delighted if this peaks your interest.